Plans to move emergency surgery and maternity services from Redditch to Worcester have been approved. All three clinical commissioning groups voted in favour of centralising those services and care for severely ill children at the Worcestershire Royal. Temporary closures of services in recent years had proved the model could work, health commissioners said. Members of the public have asked for assurances the county's hospitals are improving. Health bosses were being questioned by the public at a meeting in Bromsgrove on Wednesday. 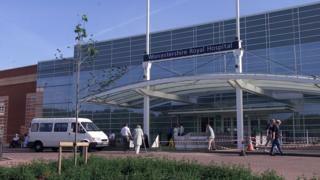 Worcestershire Acute Hospitals NHS Trust includes Worcestershire Royal Hospital, Alexandra Hospital in Redditch and Kidderminster Hospital and Treatment Centre. Dr Jonathan Leach, of Worcestershire Clinical Commission Groups, said: "If we put many of the services into one location, it's actually much better for patients. "If you're taken to a particular hospital, you've got the experience of the senior staff, the expertise, the technology and actually the evidence right across is actually it will improve things for patients. "We do accept that in terms of geographical access it's more difficult in the Redditch area and that's obviously something which we've been working on." There will now be further public consultation on the plans, but Neil Stote, who led the Save the Alex Hospital campaign in Redditch, is worried services may still be at risk. He said: "Look at the other reviews you've had, going back to '97, 2005, 2008 and so on. "If you'd implemented the recommendations of that, we wouldn't have had this five-year shambles and I have grave concerns about how we're going to implement this in the current political climate where austerity rules."